In Brief: Camp out overnight in the beautiful high-altitude scenery of the Bayinbuluke Grasslands in northwestern Xinjiang; see Silk Road sights, big mountains, and desert while on the road to and from the grasslands. 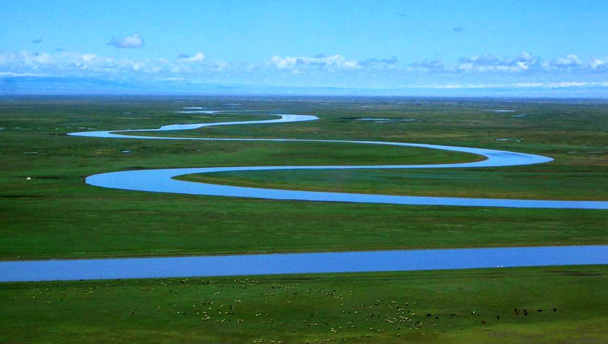 A river runs through the Bayinbuluke Grasslands, with the Tianshan Mountain Range visible in the background. Take a six-day road trip through the Tianshan Mountains in Xinjiang, passing by ancient Silk Road sights on the way to our campsite in the beautiful Bayinbuluke Grasslands. 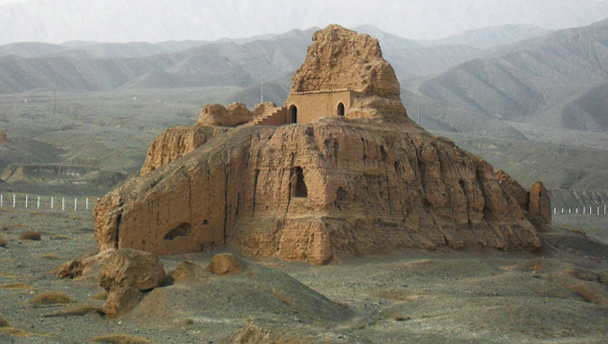 During the trip you’ll visit the ruined city of Subashi, camp near a Kazakh settlement in the grasslands, visit the Kunas Forest scenic area, and you’ll get great views of grasslands and mountains on short hikes during the drive back to Urumqi. This trip is timed for the Dragon Boat Festival Holiday. If you’re working in China you’ll need to apply for time off on the 13th, 14th, and 15th as well. 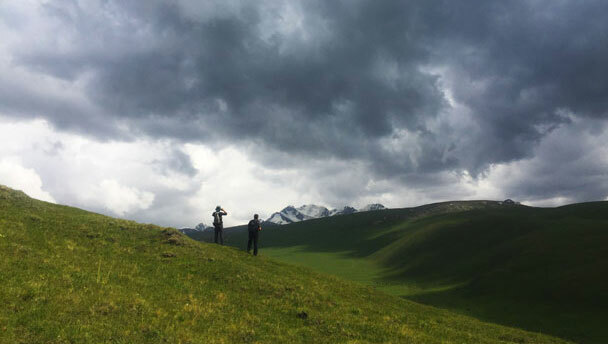 Surrounded by the tall snow mountains of the Tianshan mountain range, the Bayinbuluke Grasslands is an area of pure green grass, snow-fed rivers, and rolling hills that is 1.5 times the size of the entirety of Beijing Municipality. In the grasslands we’ll take an afternoon hike up to a lookout point to watch the sun set over one of the rivers that snakes through the prairie, and camp overnight in an area favoured by local Kazakh nomads. 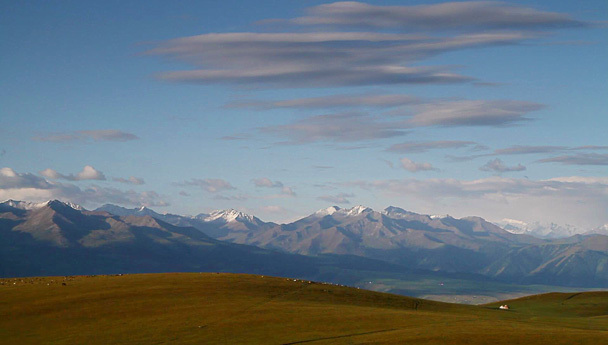 Also known as the Bayan Bulak grasslands, the prairie covers part of Hejing County in the Bayingolin Mongolian Autonomous Prefecture. Bayingolin is the largest of China’s autonomous regions, and is actually larger in area than the neighbouring province of Gansu. 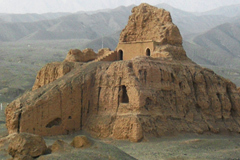 The capital of Bayingolin is Korla, and it’s in Korla that our trip will begin. Day 2 Visit Old Town, Grand Mosque, King’s Palace in Kuqa. 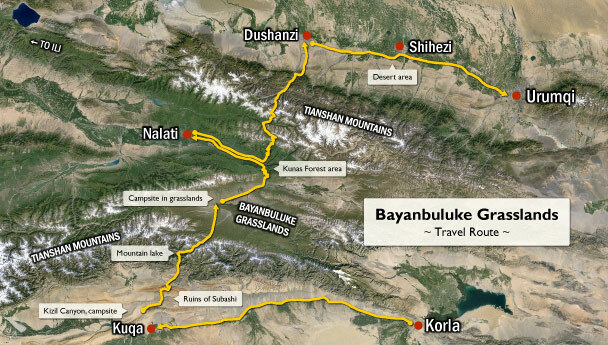 Drive to Subashi ruins, Dakziliya Grand Canyon hiking, camp overnight. Day 3 Drive through mountains to Bayinbuluke, hikes in the grasslands, camp overnight. Day 4 Drive to Nalati, stopping for short hikes along the way. Day 5 Drive to Dushanzi, stopping for short hikes along the way. Day 6 Drive to Urumqi via Shihezi, stopping for a walk in the desert, evening flight to Beijing. Take a stroll through the narrow streets of Kuqa’s old town, visit the Grand Mosque and the King’s Palace, camp overnight near the ruined city of Subashi. 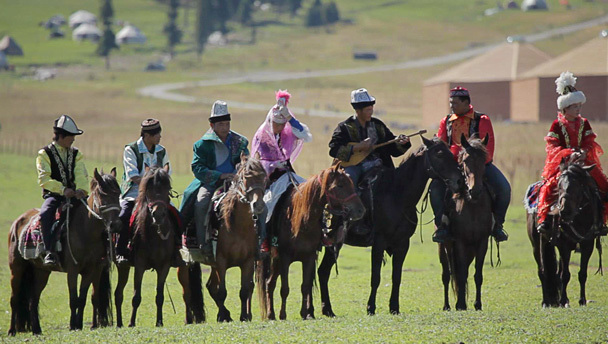 Mongolian is the first language of some Kucheans. Want to say hello in Mongolian? Sain uu! Hike in a forested area in Kunas on the way to the small city of Nalati. Drive through snowcapped mountains on the way to Dushanzi. Hike in a desert area near Shihezi on the way back to Urumqi. Weather is expected to be fairly cool, with a temperature range of 5–17°C expected. There’s a small chance of rain, so don’t forget your raincoat! 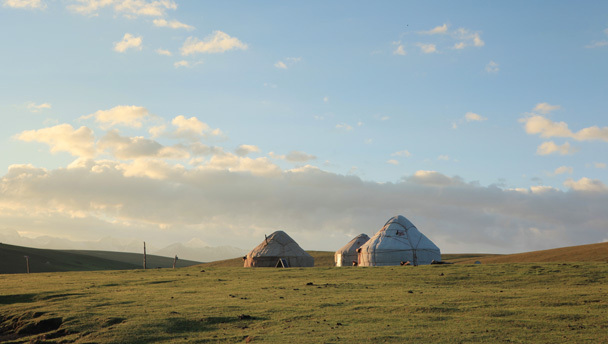 A herder's yurt, Bayinbuluke Grasslands. Click to see three more photos from the grasslands. Aside from the two nights of camping, we’ll stay in the best hotels we can find – 4-star (or the local equivalent) at least! You’ll be sharing a room at the hotel with another hiker. If you'd like a hotel room to yourself, it can be arranged at an extra cost of 900 RMB for the whole trip. We’ll flying to Korla via Urumqi, and back to Beijing from Urumqi. For the rest of the trip, we’ll be in big, comfortable jeeps. It would also be nice to bring a small gift for the driver of your jeep – they’re very friendly fellows, and would appreciate the kind gesture! Xinjiang has an unofficial time difference of two hours from Beijing. All times listed are Beijing time, but we’ll be trying to time the meals for Xinjiang time. First, make a deposit of 5,000 RMB per person so we can be sure of getting your flight tickets and hotel bookings. Pay the deposit before June 1 to qualify for the early-bird price. Please pay the balance before June 11. See a set of 40+ photos from our 2017 trip through the Bayinbuluke Grasslands in Xinjiang Province. Photos of mountains, rivers, grasslands and more, from a seven day trip in the Bayingolin Mongolian Autonomous Prefecture in Xinjiang.